Direct Communications donates $1000.00 to Pocatello/Chubbuck School District 25. 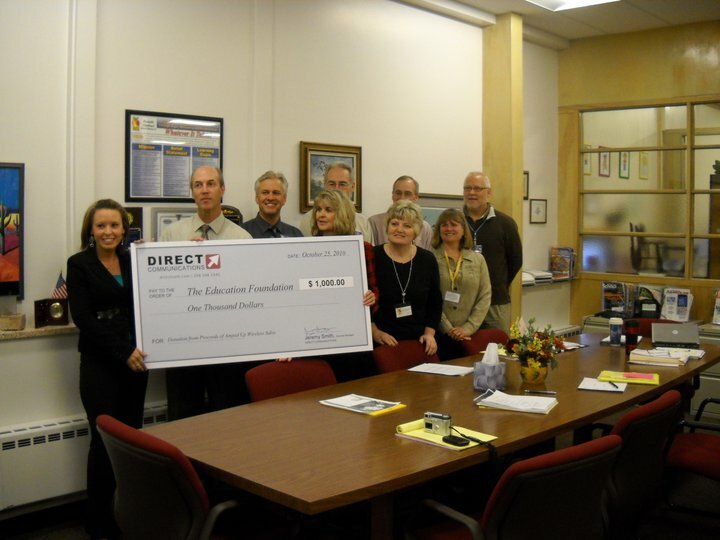 On October 25, 2010, Direct Communications donated $1000.00 to School District 25. This was in conjunction with a June 25, 2010, Direct Communications fundraiser for local education. The goal was to show appreciation to the teachers in District 25. Costa Vida donated the food for the event, and several local businesses donated raffle items to raise money for the school district. Direct Communications introduced Amped Up Wireless in the area, and pledged to donate $100.00 for each new install of the product during the launch. Anya Beauchat, Sales Office Adminsitrator for Direct Communications in Pocatello, presents donation check to School District 25. Direct Communications presented a check on October 25, 2010 at 9:00 a.m during the school district Cabinet Meeting at 3115 Pole Line Road, in Pocatello.